But how about what the unit did against quarterback Aaron Rodgers and the Green Bay Packers on Sunday night? This one leaves no doubt. 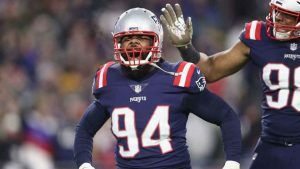 After some inconsistency early this season, the Patriots proved they have a defense that is worthy of respect, a unit that is capable of holding up its end of the bargain against top competition when it plays up to its potential. And the rush, unlike any other game this season, was sizzling. Veteran defensive end Adrian Clayborn, who came on to the field in more obvious passing situations and was relentless, relayed that the focus was on closing the pocket on Aaron Rodgers. “Just all four guys corral him and don’t let him extend plays by stepping up, or stepping back. He’s a very shifty quarterback,” he said.